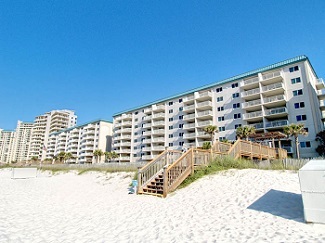 Pensacola FL beachfront condo for sale at Sandy Key. 2 bedroom 2 bath, 4th floor unit at Sandy Key Condominiums. The current owner has lived here full time for the past three years and absolutely loves it as anyone would. Sandy Key is located off the main beach road with a gated entrance, temporary boat/trailer parking, tennis courts, workout room, grills, tables, gated access to the beach with shower, assigned storage closet at no extra charge and that is just the outside. This condo is being sold completely furnished. Complete HVAC installed 1 year ago. 4th floor view means you or if this is investment property your guest, still see the gulf of Mexico while seated in your living room. This is not the property to hesitate buying! Don’t wait, come see this condo today! Perdido Key FL is the perfect place for a family vacation to enjoy popular outdoor activities in a sub-tropical climate on the Gulf Coast – this resort community is a great place for families. Experience popular Perdido Key restaurants like the Fisherman’s Corner, Sea-n-Suds, The Crab Shack, Lillian’s Pizza, etc. and enjoy some of the freshest seafood anywhere. There’s a variety of resort property including a variety of Perdido Key condos for sale, for those interested in their own slice of paradise.. Whether you’re ready for fun and adventure, a relaxing day on the beach, a real estate investment, or tasty cuisine – you can find it all on Florida’s Gulf Coast.